In keeping with the theme of many of our adventures which is “standing on the highest rock around” its no surprise that at some point we would find ourselves standing on the highest point in Minnesota. The high point in Minnesota? There is no Mountains in Minnesota is there? Well not really, but if you go to the North Shore along Lake Superior you can find what passes for mountains in Minnesota. 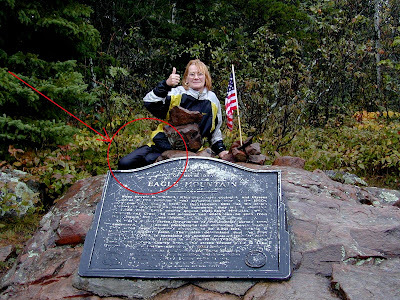 The highest point in Minnesota is Eagle Mountain. Its located in the arrowhead region about 2o miles from the North Shore down some seriously bad roads inside what is called the Boundary Water Canoe Area . The trail guide will tell you that the trail to the top of Eagle Mountain is a bit of a nasty rugged trail and about 3.5 miles to the top 7 miles round trip from the trailhead. At 2301 feet above sea level with only a 500 foot elevation gain from the trail head its not much of mountain climb. However the trail is rocky and slippery with a number of swamps to cross to get there. Well we were here, we had rain coats and we also had a change of cloths along just in case so why not! Lets give it a go its only 3.5 miles. So off we went searching for the summit of Eagle Mountain in the rain. About halfway to the summit is Whale Lake where there is a couple of camp sites on the lake shore. Not surprisingly there was no one camped there in the 35 degree rain. Just past the lake, the trail splits and there is a sign post shrouded in mist today where you can start the climb to Eagle Mountain or skirt it and head to another lake on the other side of the mountain. About an hour and a half into the hike we find the top of Eagle Mountain. Its marked with a plaque telling about the original surveyors that discovered the Minnesota high point. Some previous hiker has left a small flag. While the view is not quite as spectacular as some of the vistas from the Colorado peaks it still is beautiful even in the rain and mist. Below you seen some of the local wildlife hiding. Its a rare drowned Irish rat. Finally we arrive back at the trailhead. I have been looking forward a change of dry cloths for hours now. Here we see the rare “Drowned Irish rat” again tell us how frozen here poor fingers are. Now here is where the story get interesting! See in the photo below the nice nylon running pants that the Irish rat is wearing during the hike to the summit. She even mentioned during the hike that they were keeping her nice and dry. You see those were “MY SPARE DRY CLOTHING” she had put them on over her regular pants when she was getting ready for the hike without me noticing. My dry pants that I had been looking forward to for hours had accompanied us on the hike, but they were no longer dry! I was going to stay wet for another hour or so on the muddy ride back to civilization. I thought StPatrick took care of all the Irish Rats.